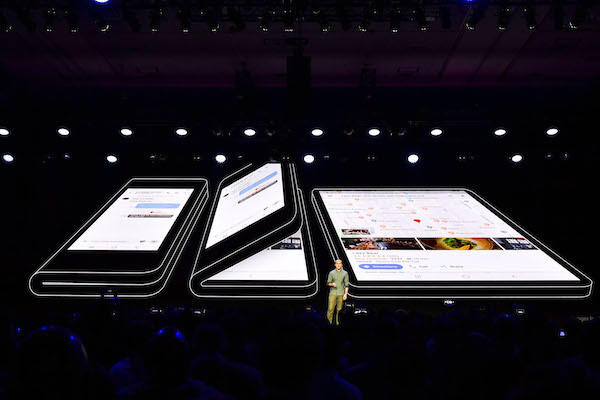 Samsung removed the cloak on its first-ever foldable smartphone during its 2018 Developer Conference, held on 7 November in San Francisco. While the prototype was put up for demonstration, it seems the model won’t be ready for market until 2019, as previously suggested. The potentially-named “Galaxy F” device—where “F” could refer to“fold” or “flex”—sports an ‘Infinity Flex Display’ that folds in half, similar to a notebook. Weighing roughly 200 grams, the gadget comes with an “external cover display” measuring 4.58 inches with resolution 840 by 1,960 and unfolds in portrait orientation. 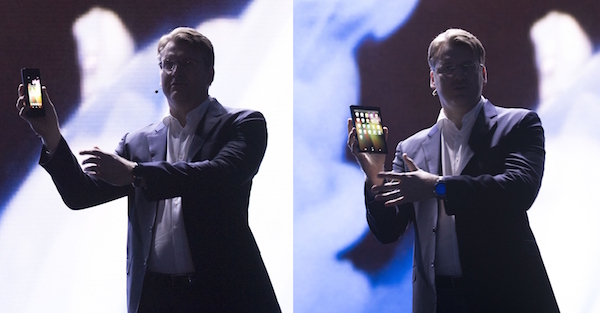 Its primary screen, measuring 7.3 inches with 1,536 by 2,152 pixels (420 pixels per inch), has been equipped with an extremely durable adhesive that, according to Samsung’s senior VP of mobile product marketing Justin Denison, enables it to be folded “hundreds of thousands” of times without suffering any damage. In place of traditional glass, Samsung uses a flexible OLED panel comprising “advanced composite polymer” and 45-percent thinner polarizer. The larger display is touted to be able to run up to three apps at any one time. Mass production of the hardware is scheduled to initiate in the coming months. On the software side, Samsung is collaborating with Google to guarantee that Android handles this form factor suitably. The South Korean company also announced its brand new ‘One UI’ made for this novel hardware. Samsung’s foldable smartphone is anticipated to launch for market in 2019 at about US$1,830 (KR₩2 million), according to Korea Times. In the meantime, California-based Royole Corporation’s “world’s first foldable phone” called FlexPai has already launched.